At the recent Google I/O developer conference, Google announce several updates and improvements to their products and services. One such update was to a very popular Google Service, Google Maps which could be one of the best Mapping services available. Google announced update makes several different changes to the well known Maps UI as well changing the focus of the application and service. Google is slowly rolling out the new Google Maps and I have been lucky enough to get it and here are my thoughts on the update. I use Google Maps several times a week, if I am going to a new business or building in the city I always look up the address on Google Maps and use the Street view feature to see what the building is like. I also use Google Maps and Navigation on my cell phone when I am in the car even though I have a standalone GPS I still use Google Maps. So for someone like me who is very happy with Maps it is hard to think of how they can improve the maps other than ensuring the mapping information is accurate. Google has also made several other improvements to Maps; one you will notice right away is the UI has changed and instead of having the map with a sidebar for searching and results the map fills the page and you have a search box and your results are displayed on the map with cards. I really like this change to the UI is gives more attention to the map and it looks really good. Google has also inserted live traffic for some streets and highways right inside the Maps. Which allows you to check live traffic conditions before you set off. If your route looks congested, you can choose from alternate routes offered by Google Navigation. The entire map is now interactive. Clicking anywhere will focus the map on that location and show you helpful things, like related places and the best ways to get there. There is also integrated information on stores, restaurants, and entertainment business using Google Local information and reviews. If you want to see pictures instead of the map you can switch to Google Earth and get a 3D view or you can view pictures taken by Google Users of the location. This allows you to get more information on the location you are searching and see real pictures. Maps will also sync across all your devices you a map you have on the desktop will show up on your phone and tablet. Here is what the new Google Maps will look like and photos to demo the new features that will come with the new Google Maps. I am really liking the Maps update and hopefully the new update will be coming to you too. If you don’t want to wait for the update to come to you. Sign up for the new Google Maps and if you are lucky Google will enable the updated on your Google account early. The link below will allow you to enter your email for a chance for early entry. I think the update from Google will make Maps so much better and give us more features to help get around the World. Let me know if you have tried the new Google Maps and what you think about it. 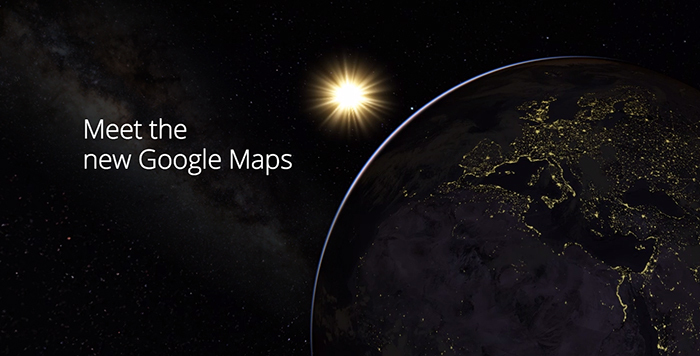 Also do you use Google Maps as your main mapping application or do you prefer a different mapping application.